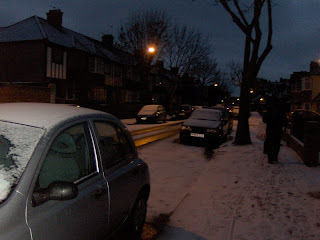 Yesterday being the 5th January heralded the arrival of the first day back to work in 2009. Apart from struggling to get out of bed at 6.15am due to tiredness as I haven't left my bed any earlier than 9am over the Christmas break, I also wanted to stay under the duvet where it was warm rather than embrace the cold of the house where the heating hadn't quite kicked in yet. 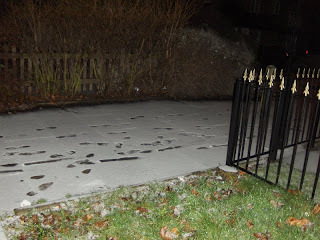 I hate scrapping the windscreen in the morning so decided to see how iced over the car was and was shocked to see snow! It was only about 2cm deep but snow none the less. I love snow. It certainly made the drive to work much more bearable and watching snowfall on my first day back was also a nice bonus. The footpath out the front of the house. Snowy Streatham walking from my car to the office. 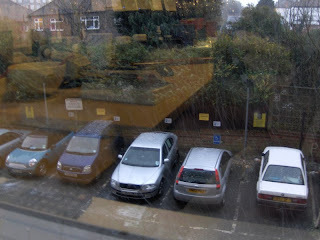 My view of a relatively heavy snow shower from my desk. 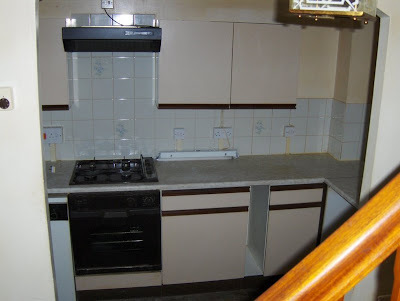 Unfortunately the secondary glazing means taking pictures is somewhat compromised by reflections.